Here we are, nearly two years after opening wide the doors at Little Roots (hooray! ), and I am finally posting something on our shop blog. The holiday season has started its slow exhale, and the shelves are happily picked thin. KC and I are so grateful for all of you. This year, we've chosen to shift our focus onto community. This will bring about a few new things at the shop! We are in the process of remodeling the back play area - adding a new wall of shelves, replacing the carpet, and building benches to surround 3 of the 4 sides. This will allow for more events - from craft & coffee mornings, to potlucks & playdates. We are also planning to carry more local & handmade items. This week, we opened a fresh box of wooden, montessori rattles, as well as some herbal salves, sprays & balms from Sol y Earth. Finally, we will be posting here on our blog bi-weekly (at least). You may see new toy updates, event announcements, stories from the community, and activities for Tuolumne County Kids. 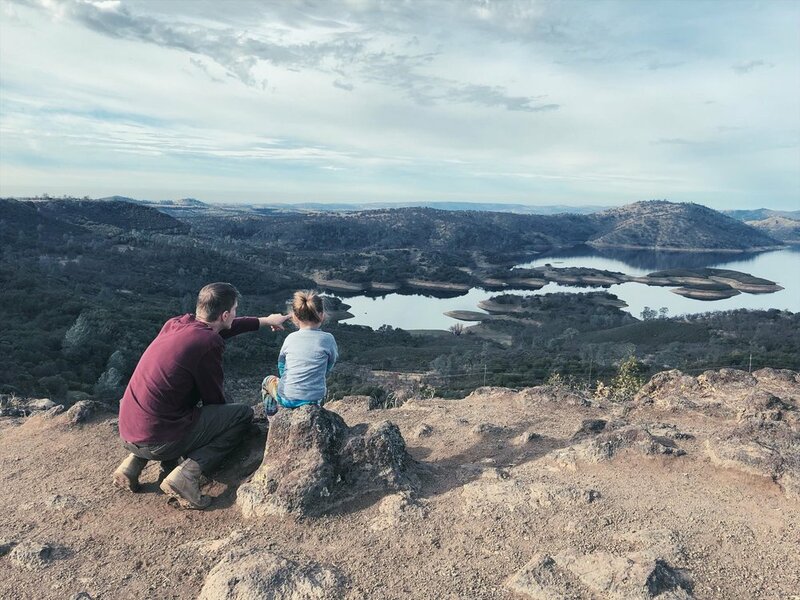 Our hope is that the Tuolumne County Kids category may be referenced when you're feeling fresh out of things to do in the Mother Lode with your wild little ones! Table Mountain is a public, 4.6 mile trail located just outside of Jamestown. The topography varies from steep & craggy (near the trail's end), and flat & woodsy. Children under five may need to be worn or carried for a portion, as it is a bit treacherous for tiny feet! During the springtime, the top of the mountain is blanketed in purple brodeia & yellow poppy. And the winter sings still, quiet, grey and white and golden brown. Looking far out over the reservoir, little wild ones can spot puttering boats, wind pushed waves, and even a hang-glider or two. Bring a bagged lunch & enjoy a peaceful bite at the top. Click here for directions to the trailhead, and here to see the trail on AllTrails. Note: these directions take you to the first gate. Some folks park here, but if you have a stable, high-bellied car, you can drive further out to the second gate, where there is more parking & a bathroom. This will save you a bit of walking. tip: bring your own water & a snack for the top!